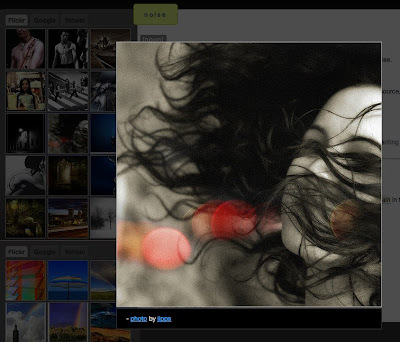 Shahi is a visual dictionary that combines Wiktionary content with Flickr images, and more! This is a really handy tool for students or in the classroom if you have a computer + projector set up. 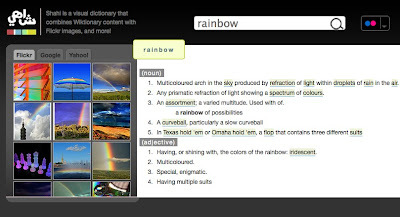 All you do is type in your vocabulary word and you get images ( from Flickr, Google or Yahoo) and a definitions with part of speech and some example sentences from Wikitionary. If you want to give your students a better view of the images that the Shahi finds in relation to the word, then just click on the image and it enlarges. Of course the most common problem with picture dictionaries is that the concepts of many words, especially at higher levels aren't 'visual' as such and are much more abstract concepts. I did a search on 'noise' and here's what I got. 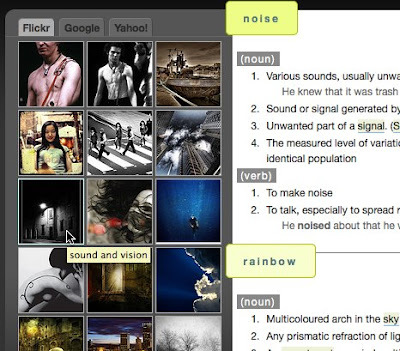 You can use this to your advantage though by getting students to think about the connections and associations between the words you search for and the images. You can turn this into a game and give points to the students with the best explanation for the connection between word and image. The explanation could be literal or more imaginative and narrative based. One other thing that I like about Shahi, is that the results from each word you type in are 'piled up onto top of each other, so if you use it as a reference throughout a lesson or activity, you still have a record there of all the words that came up. You could also use this feature in reverse, by creating an image word list before the activity so that students can prepare their vocabulary and refer to it during the activity. Shahi is a nice versatile free tool and one that your students could easily use on their own. Hope you enjoy it. Possibly a bit nervous about using this in some multicultural classes. The google images were spot on though - so I see your point about getting to students to discuss the links, best pic, etc. Yes. That's always something to watch out for, especially if you are working with kids.